Sometimes we choose books that are not typical. I chose this book, Peterson's Success with Words for my children's high school vocabulary. This book is laid out with lessons and units, and we will use the book for 3 years. In order to do that I will make a plan so that we will not go through the book too fast. After deciding how long you will spend on the book, count the number of pages that are in the book. This book has 389 pages of actual lessons and the rest of the pages are the answer keys, a reading list, and an index so do not count those. 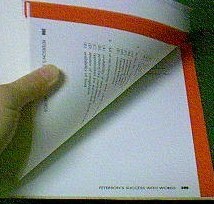 Do not count the numbered pages in the front of the book that are not lessons, unless you want to use the introductory of the book as an introductory to the class. We will use this book for 3 years. I am going to use 32 weeks per year. We school 36 weeks a year, so this will give 4 weeks of flexibility. To figure how many weeks this book will be used, I multiply 32 x 3. That is 96 weeks. Next I divide the number of pages (389) by 96 weeks. That tells me that we should try to do 4 pages a week. You will also benefit from knowing how many lessons are in the book. Go to the answer key in the back of the book and count how many lessons there are. This book has 215 lessons. This includes long lessons and regular lessons. If I divide the number of lessons (215) by the number of weeks that will tell me that we should try to do 2 or 3 lessons a week. The actual number is around 2 1/4 lessons a week. That means to do 2 lessons a week for 3 weeks and 3 lessons during the 4th week. You should always write these numbers on a significant sheet of paper. Significant meaning a piece of paper that you will not lose or throw away later. If the book is consumable, then write the numbers in the back of the book, otherwise, have a special sheet of paper that you have set aside for your lesson-planning data and file it. Sometimes you will have to change the amount of lessons per week that you are planning to do and do more or less lessons. This will depend on what is going on in the lessons and if you want to break the momentum of a group of lessons. You will also find that some lessons are too long and you will have to split the lesson into 2 or more days of work. See an example of this book planned for one semester. You will see when you look at the example that I did not faithfully follow the 2-3 lessons per week. I tried not to plan too much of the book, but I also had to keep the content of the lessons in mind when I made the plans. Overall, though, there are only 4 weeks that have more than three lessons a week and 8 of the weeks have 3 lessons. Some of those have a big lesson divided into 2 days. What is Word Attack? In the example lesson plan, you will see a reference to Word Attack (WA). Word Attack is a software program by Davidson during the 1990's that, as far as I know, is no longer published. I don't know why, it was very nice - I mean that. I could edit (WA) out of the lesson plan so you'd be oblivious to this giant black hole in the software universe, but somehow, that seems wrong.